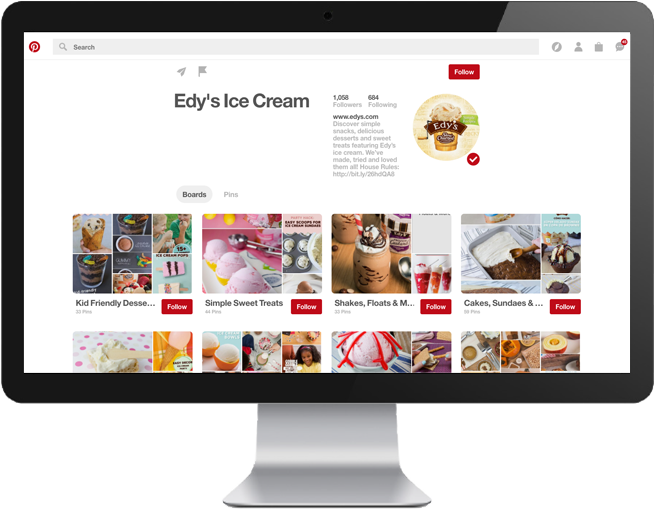 Dreyer’s (Edy’s) Ice Cream wanted to take its social media program to the next level by connecting with its target audience of moms on Pinterest. The brand approached Pan Galactic to help develop a strategy that would allow it to successfully connect with its target audience on the social platform. Pan Galactic developed Dreyer’s strategic approach, best practices and KPIs; optimized the Dreyer’s Pinterest profile, boards, and pins; and set up an analytics reporting structure in accordance with the Nestlé USA Digital Center of Excellence. to participate in Pinterest’s beta test of Promoted Pins, the platform’s first offering of paid media. The brand was the top performer in the beta test.